Top quality audio mastering. Excellent testimonials from industry legends. Brilliant rates! 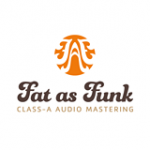 Fat As Funk Mastering is a professional audio mastering suite. Our name reflects the engineer’s heritage in the Bass music genres, but we also appreciate subtlety & artfulness. We love mastering folk, classical, indie, rock, reggae, pop, funk, soul & all genres of dance music. We have a huge list of returning happy customers, and are proud to be able to say our business is mainly built on reputation & word of mouth. We offer: Stereo Mastering, Stem Mastering, Mixing, Analogue Mastering, Audio Editing & Mix Evaluations. Our quality of work & integrity greatly exceeds our price. Our engineer is always available to discuss your needs, & we will work with you closely to meet your deadlines. We understand the complexities of the modern music business, & can work with you in many other facets, using our contacts in pressing & replication, sync licensing, recording studios, graphic designers & more. We offer a free mastering demo for new clients, so you can try us out with no risk. We were one of the first mastering studios to offer this, back in 2007. Try out your new favourite mastering suite today!